In The Little Girl Praying on the Hill, we find a story filled with heartbreak, pain, suffering, as well as joy and peace. Even with all of these various emotions, this little girl is challenged within herself to find her purpose and reason for living. Having a strong and vivid imagination sometimes got her into trouble as she would forget her chores. Her father was a drunk and her mother carried more than her fair share of the load. She longed for a time when her father wouldn't be drunk. He promised her time and again that he wouldn't drink any longer, only to not live up to those promises. She used her imagination as a powerful way to escape the problems of living in her environment, all of the hard work and her drunken father. She would rather live in imaginary castles and lands than the one she was in. Reaching out to better understand God's will for a little girl's life, we find author Olga D. Agostino taking the reader along a very disturbing trail that shares various emotions and feelings. In The Little Girl Praying on the Hill, there is also the description of a baby sister's death, the beating from a mother and wanting to die herself. This book is filled with sorrow and pain, yet also of how a little girl chooses hope and determines to find a way to make it in a sad and uncaring world. This is a book to encourage the reader that no matter what one's circumstances are, there can be better times ahead. She spent a lot of time alone, or so it seemed to the people in the village below. Every day, she would take the sheep up to the top of the hill, where she would spend hours. –until her daydream was interrupted by a furious someone who angrily reminded her about forgotten chores. Back to the sad reality–a life in the mud, surrounded by poverty and hopelessness. There was little room for sadness; when her younger sister died, her own dress was taken for the burial. The little girl mourned only for the dress that had been taken away from her. There were no tears for the sister. In a world where despair reigns supreme, a child’s mind turns to prayer. But when the help isn’t immediate, faith must carry her through the difficulties of an “unfair” life. how can one not be captivated? Such descriptions! No wonder Ms. D’Agostino is an award-winner. This is a sad story of a child’s feelings of helplessness as she tries to cope with her alcoholic father who continually humiliates and beats up on her mother. The only way her brothers and sisters can protect their mother is by hiding her under the piles of hay in the barn while the father is on a drunken rampage. Yet the young child feels conflicting emotions between the love she has for her father and her despair as she watches his cruelty towards her mother. There is no love in the young girl’s life; the mother is too exhausted from her long days toiling on the farm, and the alcoholic father is emotionally unable to fulfill his role of husband and parent. She finds solace from her loveless world by embracing the beauty and stability of nature: “the blue sky became her escape from reality”. Love only comes to her when she imagines herself dead—only then does the mother show her affection by mourning for her loss child. This is a poignant story—a variation from the author’s usual child-oriented stories—but one that will remind you of the stark reality lived by other children around us who are starving for love. Well done, Olga D’Agostino, this story will bring tears to many. This is the author's first short story about a little girl endeavoring to understand God's will. She is seeking to decipher what is the point of her existence. Trapped in a poor rundown Russian village in post World War II, she strives to escape by using her imagination to create the beauty of nature within her mind. The author writes in the first person, the characters are generic and are never given first names. “The people in the village called me a lost soul. I wasn't lost. I was hiding from the harsh world in my imaginary kingdom.” Women in this small village struggle all day to work the farm; most of the men are habitually drunk. One day the little girl's baby sister dies; she struggles to understand why her mother has taken her only dress for the child's burial. The children sell dried lavender to obtain the only toy available, a ball. When the village children cheat the storekeeper by filling the bag with rocks to make it heavier, they must pay the penalty. The little girl sometimes forgets her chores; one day she pretends to be dead. That deceit brings an unexpected result. The author uses alliteration, metaphors and personification freely to paint the landscape and characters. Our little girl's best friend is the wind even though he can be a harsh taskmaster in winter. She enjoys gazing at fields of wheat in the distance and the clouds in the sky. She imagines submarines in the stream. While the language is somewhat flowery, it works beautifully in this emotional tale. There will be a sequel named “Taste of Bread.” I will be eager to read it because I am anxious to find out what happens to this endearing little girl and her family in this poignant tale. Recommended for young adult and adult readers. Wow, what a deep and a deeply disturbing book. The subject matter is far from being juvenile even though this author is known for her children's book writing. The prose is lovely, if haunting and heartbreaking and the story itself will stick with me for a long, long time. Well edited, well timed, the story moves fast through a landscape of loss and heartache. I am a long time fan of Mrs. D. children's books. I was quite surprised to find out that she is writing for the older audience also. 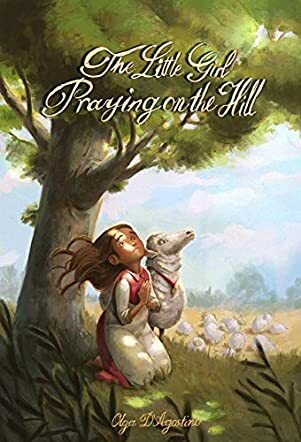 The Little Girl Praying on the Hill is the heartfelt story of a little girl, who was born on a farm in the Soviet Union in the post WW II era. The story describes the life of an innocent child, who tries to survive heartbreaking reality by escaping into her imaginary world, filled with beauty and kindness. A world where there is no place for evil, hate, or pain. People call her strange, because she is different from the children in her village. Unlike other children who resigned to the sad existence, the little girl has a hard time to accept her real world. Two parallels of her world are running closely to each other. One escapes ahead and opens her soul, and lets out pieces of her painful memories. The desperate child questions God. Why the real world does not look the same, as it exists in her imagination, untainted and innocent? Why does she look to escape into unreachable places? Why does God punish her people? The first parallel exposes the happy moments of her life, but her second parallel is catching up with her poignant memories, full of sadness and pain. Her innocent imagination distracts her from the sad world, but the second she opens her eyes, the visible line between beauty and ugliness leaves nothing, except emptiness. In a short period, the author opens up two worlds to the reader, the beauty and kindness, the sadness and the ugliness. Just like parasites, her two emotions feed on each other. The beauty complements the ugliness; the happiness complements the hopelessness. By creating the beautiful imaginary world, Mrs. D'Agostino purposely distracts us from her depressing reality, full of bitterness and frustration. Before we know, she plunges us back into the misery of the little girl's life, filled with desperation and disappointments. With each page, I relived the life of the struggling child, overwhelmed with the factual world. It amazed me how the search for love and acceptance made the little girl realize her journey. I absolutely love how the author portrayed the little girl's imaginary friends. I felt as if the wind became my friend, the wheat field became my home, and the sky became my escape. The author surrounds the reader with astonishing imaginary pictures and sad reality at the same time. When the little heroine flows in her beautiful imagination, I cheered her up, but when she must return to the dreary life, I felt crashed. This soulful story kept me in tension to the last word. It felt like a breath of wind, strong, emotional, and deep. It would not let me relax or become indifferent. The two worlds of the little girl beautifully complement each other; the personal made me cry, the imaginary lifted my soul up to heaven. I am glad I had a chance to relive the life of this little girl and discover a new Mrs. D. I read this short story a few times, just to feel the spirit, energy, and emotions. This moving story made me think. A captivating short story of a desperately deprived upbringing authentically observed through the eyes of an exceptional child. She manages to rise above her miserable situation at least for brief periods through her vivid imagination and tenacity. The worst poverty of all is the lack of love that her parents are capable of providing for her, and yet she gleans whatever she can and I think that she realises that they too are victims of the circumstances they're forced to live in. What a LOVELY read this was! I really enjoyed this short story and I think it will appeal to many people. The writing was clearly defined, interesting and this book was very nicely put together! Well done! This story gives a great insight into the mind of a young child. Her search for answers is something we have all experienced at one time or another. It is worth every minute of time to read it.